Marseille is France’s second city. The European Capital of Culture in 2013, Marseille is in the Bouches-du-Rhone department in Provence and the PACA region. TGV trains to Marseille Saint Charles station leave from Paris Gare de Lyon (20 boulevard Diderot, Paris 12) all through the day. Paris to Marseille station in 3hrs 09 mins. Lille (which connects with Eurostar) to Marseille station in 4 hrs 46 mins. Charles de Gaulle Airport to Marseille station in 3 hrs 50 mins. Popular direct connections include Avignon, east directly along the Cote d’Azur to Nice, Lyon, and Toulouse. Marseille has good high-speed links TER (non TGV) with major French cities such as Aix-en-Provence, Narbonne, Toulon and Nantes. See the major TER services on the TER website. Marseille Saint-Charles station is on rue esplanade St-Charles, very near the city center. Now you can travel direct from London to Marseille without changing either trains or stations. The new service started on May 1 2015, taking you from St.
Pancras International to Marseille, with stops at Lyon and Avignon in just 6 hours 27 minutes. Great Rail Journeys is a company which is flexible, helpful and efficient. This UK company organizes good, escorted group rail holidays. Check out some of their ideas on their website. Typical escorted group holidays include 6 days in the Dordogne and the Lot from £645 per person; and Languedoc and Carcassone (7 days from £795 per person). Great Rail Journeys will also tailor-make you a holiday, combining river trips, city breaks and whatever else you want to see. Check out 4 days on the Cote d’Azur in Nice and Monaco at a cost from £320 per person which includes rail travel, 3 nights in a 3-star Nice hotel and a rail excursion to Monaco. Other destinations include Paris and Reims (from £ £470 per person); Paris and Avignon (5 days from £515 per person). Marseille-Provence Airport is 20 km (12 miles) north west of Marseille. It’s a major airport with national and international flights, including New York and London. MP2 is the connected airport for cheapflights. A shuttle bus taking 5 minutes connects the two. La Navette shuffle coaches run regularly to St-Charles railway station taking about 25 minutes. Destinations include Paris, Lyon, Nantes and Strasbourg; Brussels; London, Birmingham, Leeds and Bradford; Morocco; Algeria; Madeira; Munich and Rotterdam. Paris to Marseille is 775 kms (482 miles) taking around 7 hours depending on your speed. There are tolls on the autoroutes. 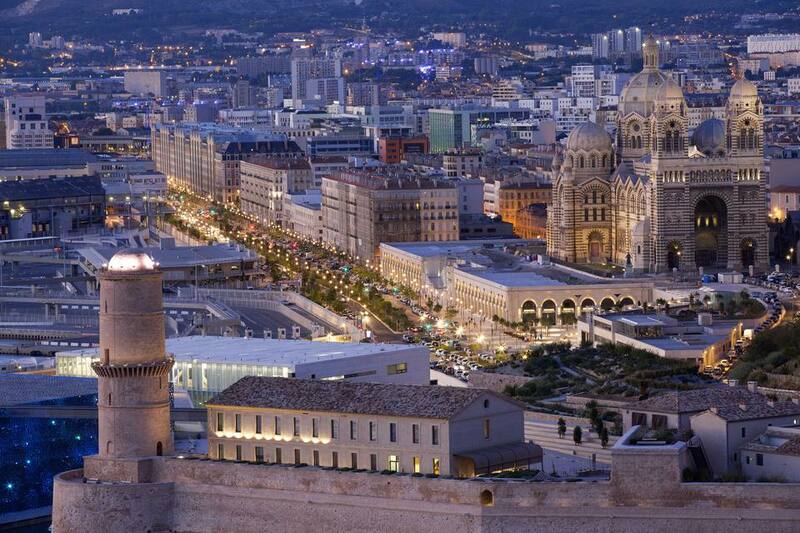 Marseille is easily accessible as three motorways linking Spain, Italy and Northern Europe intersect at Marseille. By bus/coach Eurolines offers a cheap service from London, Gillingham, Canterbury, Folkestone and Dover to Paris Charles de Gaulle Airport and Paris Gallieni. Six coaches a day; 2 overnight; journey is 7 hours. The Euroline stop is at the Paris Gallieni Coach Station, 28 ave du General de Gaulle, just by the Gallieni metro station near the Porte de Bagnolet (Metro line 3, final stop).